Explanation: This is the last thing that the Spirit rover on Mars ever saw. Operating years beyond original expectations, Spirit eventually got mired in martian dirt and then ran out of power when investigating the unusual Home Plate surface feature on Mars. a href="http://planetary.org/blog/article/00003046/">Visible in the above panorama are numerous rocks and slopes of the surrounding Columbia Hills of Mars. 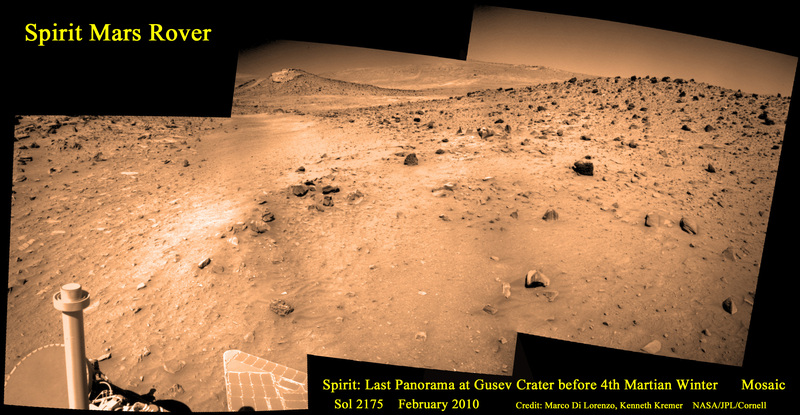 The strange hill with the light colored top, visible near the top center of the image, has been dubbed von Braun and was a future destination when Spirit got bogged down. A leading hypothesis holds that von Braun is related to martian volcanism. Last week, NASA stopped trying to contact Spirit after numerous attempts. Half a world away, Spirit's sister rover Opportunity continues to roll toward Endeavour Crater, which could become the largest crater yet visited by an earthling-created robot.